The Noyse Merchants specializes in presenting programs with full ensemble, including vocalist, as well as duos and trios. Click HERE to email us with your needs! Music from Shakespeare's time, Songs from Shakespeare's plays and the English Renaissance. Sephardic music from Spain, generally taken from the 12th through the 16th centuries, as found in the countries where the Sephardim finally settled. Spanish music of the Renaissance and Baroque. Middle Eastern music with ancient connections to the Middle East. 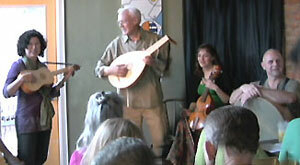 Duets or trios with Hurdy Gurdy, recorder, drum, etc. Instrument demonstrations. We currently have a large selection of historically correct instruments. The important thing to note about The Noyse Merchants is our access to extraordinary resources, including lute-making, baroque guitar making, and medieval instrument construction. The building of early instruments in my workshop here in Cincinnati allows us to experiment with different early music sounds and tone colors. We like to weave pedagogical and performance strands together in a way that makes historically-informed performance of early music enjoyable to the broadest spectrum of listeners. This means an emphasis on improvisational performance in historically informed styles. for Renaissance guitar, lute, viola da gamba, and percussion.